Sept 1/13 H is for Hospital Garden . This is part of a beautiful garden, The Ted and Lois Healing Garden at the Lois Hole Hospital for Women, part of the Royal Alexander Hospital in Edmonton. I've been absent from the dailes this week, as my daughter is back in the hospital. Now, 33 weeks pregnant, they have found the cause of all her months of kidney stones, itches and many health problems and repeated visits to hospitals. She has Hyperparathyroidism. Thanks to a wonderful team of specialists at the Royal Alex Hospital, there is a plan for her and the baby and a meeting with a surgeon at the U of A Hospital next week. So glad to hear that they have come up with a plan for your daughter. Really nice, like the colors and description. Great composition. Beautiful shot; I love the grasses against that wonderful fence! I'm so glad they found out what is wrong with your daughter. That must have been a terrific worry for you all these months. A fun composition.. Wishing your daughter & baby the best! Very appropriate capture for H day! 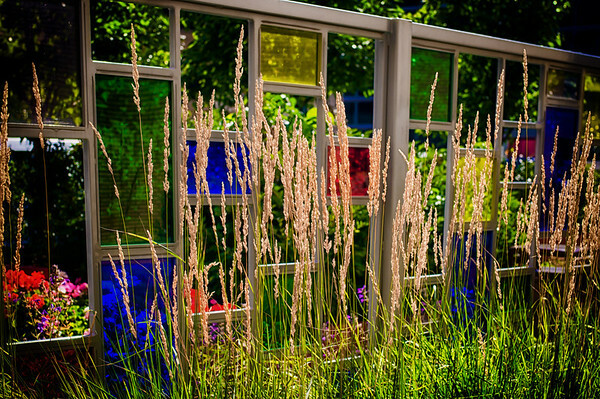 Like how they've incorporated coloured glass as well as plants into the garden.